A fight over the family Christmas card escalates into a major feud between Kourtney, Kim, and Khloé. Meanwhile, Scott feels guilty for moving on to a new relationship. Kim and Khloe try to get to the root of Kourtney's bad attitude; Khloe and Scott formulate a plan to prove Kris isn't the art expert she claims to be. Kris worries that pregnant Khloé is taking her healthy lifestyle too far; Kim takes her morbid fascination to the next level. After an intense few weeks of fighting with her sisters, Kourtney considers spending the holidays away from her family. Meanwhile, Khloé hides from the critical public eye until her pregnancy announcement, and Kris fears she's being poisoned. Kourtney is devastated when Scott introduces the kids to his girlfriend; the family is determined to redeem themselves on "Celebrity Family Feud". Kim prepares for the birth of her third child, Khloe struggles to choose a godparent for her baby and Kourtney makes her dancing debut in a flash mob. Kourtney is furious when Kim leaks some personal information about her to the family. Meanwhile Kim struggles to make Kanye a priority, and Kendall lets loose on a whirlwind trip to Paris. Kim shoots a Yeezy Season 7 campaign in Japan, but worries her sisters' fashion sense might jeopardize its debut. Kris gifts her friend with a face lift, but fears she might have hurt her. Episode 10 - Let's Play Ball! The Kardashians take on the Jacksons in a charity softball game; Kris pools her resources to renovate the Watts Empowerment Center; Khloe and Scott devise a clever plan to reveal Art Vandelay's true identity. Inspired by the March for Our Lives demonstration, Kim meets with the survivors of the Parkland shooting to learn about their movement; Scott revives his podcast with Khloé in Cleveland; Kylie feels insecure about her post-baby body. Khloé is blindsided by news about her relationship just days before her due date; Kim worries that Khloe's delivery will fall on the day of her high-school reunion; Scott and Kendall team up to do some extreme sports. 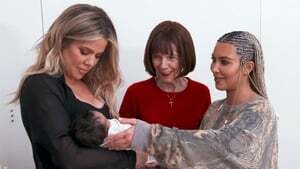 The family rushes to Khloé's side as she gives birth and comes face-to-face with Tristan after news of his infidelity broke; Kim reconnects with friends at her 20-year high school reunion. Episode 14 - Vegas, Baby! Khloé and Tristan return to Los Angeles with True, but Kim and Tristan have unresolved tension over his infidelity; Kourtney travels to Washington, D.C., to speak in front of Congress. Kim returns to Paris for the first time since the robbery. Kourtney fears she waited too long to freeze her eggs, and Kendall worries she’ll humiliate herself in a charity poker tournament. Kim devotes her time and energy to helping free Alice Johnson from prison. Khloé stresses about spending her first night away from baby True. And Kanye finds himself in hot water over some controversial comments.